Today and tomorrow (Wednesday 28th March) heralds two days of networking, exhibits and seminars at the Sandton Convention Centre in Johannesburg for Power & Electricity World 2018. This event, at which Victron Energy are exhibiting, brings together leading companies to showcase a wide range of technologies aimed at helping transform and innovate the African energy sector. If you are in the area do come and visit, where Andre du Rand and his team will be delighted to advise and demonstrate the latest offerings from Victron Energy. Details of the event are here. “Victron are showcasing several new products including Smart Battery Sense, more 250V MPPTs and the MultiGrid, which has recently has been certified for the South African NRS 097-2-1:2017 anti islanding regulation for embedded generation systems. 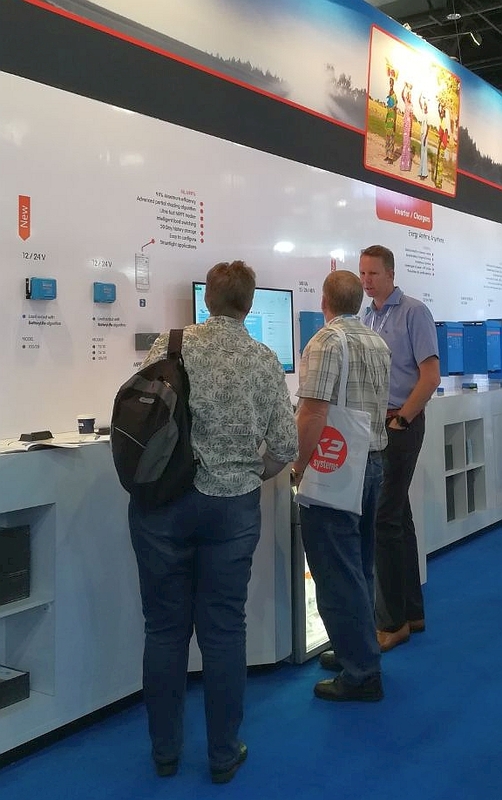 Today the booth was busy with lots of inquiries for off-grid systems incorporating LiFePO4 battery systems and the popular ESS systems. We were also visited by OEMs requiring back up power systems for remote locations and other mobile applications. Running in parallel with the exhibition there were product and solution training sessions, hosted in French by Yoann le Fol. Tomorrow the training is in English.